A movie of interlocking and connecting stories that tackles racism in ways that are sometimes preachy, but ultimately pretty creative and powerful. 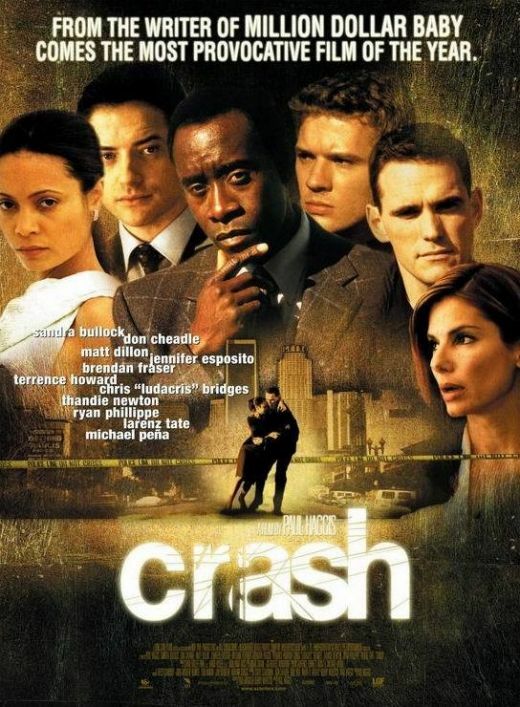 Crash is a movie about racism in los angeles and how there is bigotry and corruption under the surface of everything. That might sound very negative, and it is, but at the same time, the movie shows how there is underlying good in everyone and how a lot of people are really just misunderstood. It’s a moralistic tale that connects numerous interlocking stories like short cuts or any of the movies that followed it. And it’s a movie with multiple messages, all about how there’s good out there, and how good guys can make mistakes and bad guys can do some pretty kind things for other people when the situation calls for it. A lot of that sounds preachy, and it is. This movie won best picture of the year in 2005 and it was rightfully deserved because it was dramatic and emotional and also stayed true as a commentary of our current state of affairs. especially when looking at the ever changing cultural clash of a melting pot that this country has become. but many people had a hard time with a movie that hit you over the head with it’s morality, and this movie received a very strong backlash against it following the oscar win. The truth is, it is preachy and moralistic and a little too simple at times, but it’s still a good movie. That’s because it doesn’t hide what it is and play it safe. For example, early on, there is a scene where sandra bullock and her husband brendan frasier are walking down the street, heading to their car when two black guys start walking over in their direction. The guys are Ludacris and larenz tate and they walk next to each other talking about racism like how the black waitress didn’t fill their coffee enough or how sandra bullock has just clutched her husband’s arm because she saw them coming. And then they pull guns and high jack bullock and frasier’s car. So even though they’re arguing for political correctness and how it’s unfair that black people are treated like they’re all criminals, they are really reinforcing the stereotype by being criminals themselves. It’s that kind of irony that drives the movie. It’s a film that is not afraid to make statements that both condemn racism and support it, or at least justify that there are real reasons for it. Similarly, when bullock gets home that night, she tells her husband that she thought something was up but didn’t say anything because she was afraid she would sound racist. And as it turns out she was right, and had she said something, maybe this wouldn’t have happened. That’s where she’s coming from, anyway. Bullock’s story is but one of many in this large and creative web of storytelling. Her story is connected to others because husband Brendan Frasier is the DA of los angeles, up for reelection soon, and gets involved in a case where a white police officer shot a black cop. 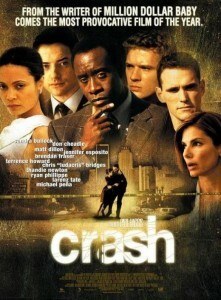 Don cheadle is the lead detective running that case, along with his girlfriend and partner jennifer esposito. Cheadle can be connected back to frasier because of his relationship with one of the criminals who stole the car. And this little circle of cheadle, the criminals, and bullock and frasier connects to two other circular stories too. It connects briefly to the story of a hispanic locksmith who comes in and installs new locks in bullock’s house before going off to have his own story with a persian family that owns a store. the family hires him to do their locks, only they need to get a new door and there’s nothing he can do about that. When the store gets robbed, the father of the family blames the locksmith and comes after him. The characters in this story are the least known actors in the film. In fact, years later, only one of them has become a name actor, and even he (Michael pena, who plays the locksmith), is barely recognizable. Despite that, the story gets almost an equal amount of time as the other stories and is certainly the most powerful of them all. When the gun goes off and we see pena’s face as he believes that his worst fear has come true, it is a truly heartbreaking moment. His open mouth as he screams, the movie’s use of sound to not let us hear anything besides music, and the careful pause of the film, holding out the moment for as long as it can, without showing us the aftermath, is really the heart and soul of the film. But this story is the least connected to others, and that’s okay. It does what it needs to do and gives us some very powerful moments. I like that it’s not only about the relationship between pena and the family, but also shows the racism the family is met with when they go to a store and try to buy a gun. Even september 11th is brought up. this movie is not afraid. The third circle of a story is the one involving matt dillon as a racist cop and his partner ryan phillipe who wants not part of it, and the prominent black couple they pull over one night. That couple is husband terrence howard and wife thandie newton, and dillon has his way with the wife right in front of her husband. Later on in the film, dillon’s path crosses with the wife’s again, in what is the second greatest moment of the movie behind the michael pena, daughter-shooting. Dillon and newton’s second encounter involves a car accident and explosion and bravery at its finest. And while dillon is running into newton again, terrence howard runs into phillipe for a second time. It might seem unbelievable if it was a chance encounter at a grocery store or something, but writer paul haggis is too smart for that. He gives us a scene where howard challenges the police, and so phillipe arriving at the scene to do his job makes total sense. The movie connects all of these characters, but more important than the connections are the stories they get involved in. Howard’s story about how he needs to act more black, even if it does reenforce the stereotype is an interesting step in the wrong direction. And yet by doing what he does, he helps ludacris figure things out and get himself on the right path. The movie is smart in that it knows what will make for powerful scenes and gives us edge of your seat moments mixed into it’s creative storytelling. It’s a smart movie that has executed on the formula robert altman started with shortcuts better than any other movie in history that has tried a similar approach.